No matter what sort of business you are running, your windows are important. Potential customers see those windows as they walk in front of your building. It lets them know a lot about the kind of business that’s behind them. Windows actually serve many purposes for a business. They can be used as a display case for products or to hold advertisements for services. Or they could be used to provide extra privacy for inside patrons while still allowing in some sunlight. 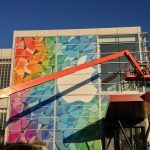 Whatever you decide the purpose of your windows is, you can usually achieve that goal with the help of window signs and customized graphics. 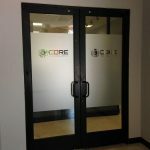 Let Carolina Custom Signs & Graphics help you find the perfect decals, graphics, signs, and stickers for your windows. 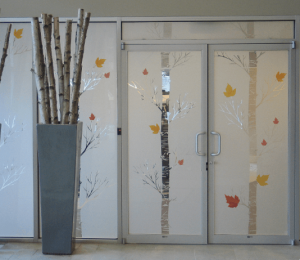 They design quality custom window graphics that will grab the attention of people who walk by. Pick up the phone and call Carolina Custom Signs & Graphics at (336) 252-2032. You’ll receive an in-depth consultation and estimate entirely for free. You can easily get the graphics and signs you need by working with Carolina Custom Signs & Graphics. They employ educated and experienced graphic design artists who will work closely with you to design completely custom and unique graphics. Those graphics will be designed to help you meet a specific goal and are guaranteed to match the mood and theme of your brand. It’s one of the best ways to communicate with customers outside of the physical building. 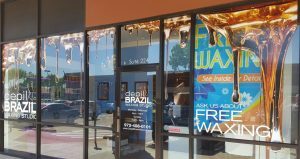 Often times, business owners know that need a vinyl product for their windows, but they just don’t know what it should look like. That’s nothing to worry about. You can sit down with a specialist or call our office for a free consultation. There, you can discuss your needs and we will recommend the ideal vinyl solution. Our solutions will meet your needs and fit in your budget. When was the last time you visited a retail store and didn’t see a display in one of their windows? They are extremely common because the store owners realize what an important role they plan in influencing customer purchases. The display usually advertises reduced prices, an ongoing sale, or a specific product. 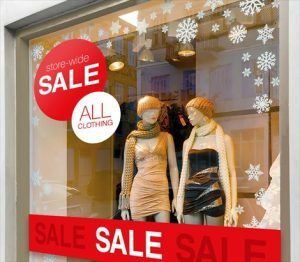 Window displays encourage many purchases at retail stores on a daily basis. It’s important to have the displays updated on a regular basis. This could be seasonal to highlight the latest products. Some stores update them every month as they start a new sale. It’s entirely up to you. Various office buildings rely on vinyl privacy film for their windows. It’s commonplace in law firms, real estate agencies, and at therapists offices. The film can give the window a frosted glass appearance, which improves privacy as well as aesthetic appeal. 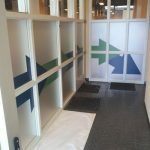 It’s also not uncommon for such offices to choose window graphics that display the logo or name of the business. It’s a great way to increase brand awareness. People walk or drive by the business on a regular basis. The logo on the window stands out and reminds them who you are. Are window decals just for companies that sell products? Absolutely not. It’s a great way to advertise services your business offers as well. Our graphics experts are capable of creating elaborate scenes that depict employees performing specific services for customers. We will work with you to ensure that potential customers completely understand what it is your business offers. We will even help install the graphics after they are completed. Our goal is to work with you at every step of the way. 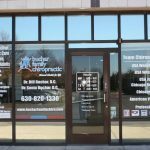 That means beginning with a free consultation and ending after we install your completed window signs. And, of course, we hope to work with you in the future as you replace or update your window graphics. Call Carolina Custom Signs & Graphics today at (336) 252-2032 for a Free Consultation with a Window Signs Expert!